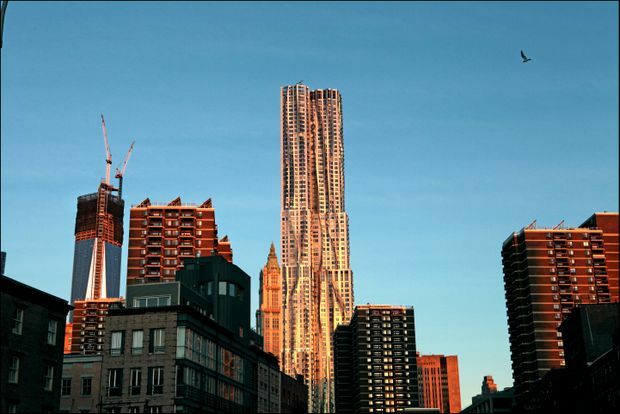 Frank Gehry is ready to go big. Seated in a downtown Toronto office tower, the world’s most famous architect is looking at the skyline that he’s about to remake with two skyscrapers, including the tallest residential building in Canada. Models of the project, perched on a table in front of us, tower over a wooden mini-Toronto and crowd the real-life towers in the background. That’s not to say that Gehry isn’t proud of these buildings – his first large-scale works in the city where he was born. He’ll admit that he is proud, if you press him a bit. Proud, but not totally happy. Gehry has always been ambivalent about success. And the Toronto development – a massive, developer-driven project, combining condo apartments, retail, academic space, offices and possibly a hotel – represents success in a very conspicuous form. Gehry is a complex man, who has talked often about his struggles with anxiety and with the creative process. The details of his intellectual legacy will emerge over time. But this much is clear: The Toronto project will be an important late achievement, in a life and in a unique artistic career that has changed the world. It will take him deep into the world of commercial development – which has often been perilous for architects – and allow him, for the first time, to remake the skyline of a major city. Its two towers on King Street West would be among Toronto’s most aesthetically ambitious tall buildings and among the most ambitious buildings in the country, period. And they now seem almost certain to go ahead. Architect Frank Gehry stands in front of a model of the Mirvish + Gehry project at the Great Gulf offices in Toronto on May 18. Dubbed Mirvish + Gehry, the project was set into motion by David Mirvish in 2012. It has evolved through the planning process from three very tall towers to two and received city approval in 2014. Gehry’s office has continued to redesign it. Last fall, developers Great Gulf announced they had bought the project from Mirvish. They are moving ahead in partnership with Dream Unlimited Corp. and Westdale Properties, and are now planning to submit the design for final approval this summer, and start sales on its condo apartments in early 2019. Gehry came to Toronto last month to present the latest design. The version he was showing off to city officials (images remain under wraps for the moment) represented the most complete. Slightly tweaked from the last version, it has two towers wrapped in a mix of glass and metal panels. The taller west tower is mostly glass on the south side, and metal on the north; the shorter east tower has the opposite. Each one is broken down into a series of smaller components, which makes their scale more comprehensible. “The space in between is more powerful than anyone understands,” Gehry says. That is, to say, Duncan Street; the two main towers would span that street, which is being reimagined by the city as a “cultural corridor.” The current Gehry proposal shows the two buildings reaching out across the street with billowing multistorey canopies of glass, elements that would create a strong sense of place. The term “sculptural” gets thrown around a lot when it comes to architecture, but Gehry has earned the right to use it. More so than any other prominent architect, the ideas and methods of visual art shape his buildings, and more than any of his contemporaries, he’s responsible for our popular understanding of architecture as an art. “He’s one of those rare figures in any discipline who form a point of intersection between advanced work and popular taste,” says Paul Goldberger, a New York critic who has known Gehry for decades and wrote his biography, Building Art. Gehry, born Frank Goldberg in Toronto in 1929, followed an unusual route to stardom. Raised in Toronto and Timmins in a working-class Jewish family, he moved to Southern California as a teenager, following his erratic father, who was ill. Young Frank served in the U.S. Army and launched a low-key professional career as an architect. By the 1970s, he was a middle-aged art lover who hung out with some of Los Angeles’s leading artists, among them Ed Moses, Ed Ruscha and Robert Irwin. His day-job architecture, mostly for developers, was relatively quiet modernism. The technical and financial legacy of this period is still with Gehry: He is acutely proud of his ability to get things done. “I really am interested in the process, in how you build,” he says. “I’m committed to budget control. I’m committed to technical responsibility with clients and delivery systems.” He is reluctant, he says, to be classed as an artist. And yet in his 30s he was working passionately on side projects, including houses for artist friends, that explored radical territory. Then, in 1978, he renovated a house for himself and his second family, with wife Berta, in Santa Monica. 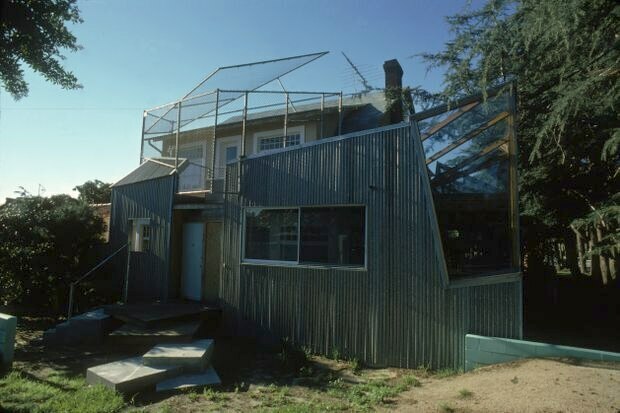 Gehry took a Dutch colonial house and built additions around and atop it, cloaking the ordinary building in chain-link fence, corrugated metal and plywood. This produced an “unfinished” quality that he likened to the work of abstract expressionist painters Jackson Pollock and Willem de Kooning, and it also showcased the humble materials that define much of our cities. The house was undeniably weird – some neighbours were not impressed – but also comfortable, with a big kitchen where Berta could cook for them and their two sons. It was a manifesto, but also a home. The specifics of the manifesto were a bit obscure. Gehry is a political progressive, but as an architect he has never been an ideologue. His architecture, then and now, does not tell you what to think. This is unusual. Architecture is full of big ideas and big talkers. And Gehry came of age in the 1950s, when architecture in the United States was dominated by the grand plans of modernism. The 1970s and 1980s saw the growth of the short-lived postmodernist movement, in which some architects looked back to history and reappropriated stylistic elements from the past in a self-conscious way. Gehry never joined that club; he was inspired by history, but not by theory. He built a few structures that could easily be classed as postmodern, and he was and still is interested in history. But his intellectual approach is more that of an artist than a polemicist. Likewise, it was an awkward fit when he was classed into the deconstructivist movement of the 1980s, with people such as Daniel Libeskind who saw architecture as a tool to interrogate social conventions and power relations. Remarkably, he has been able to do that. 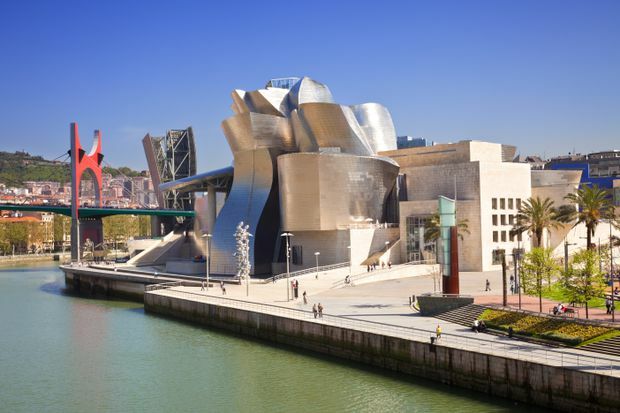 In 1997, his Guggenheim Museum Bilbao brought avant-garde architecture – and Gehry – into the global spotlight. The museum helped transform an obscure Spanish steel town into a cultural tourism hot spot, and many people saw the building itself as a work of art. Its stack of galleries was wrapped in billowing sheets of titanium, which give the building’s surfaces a magical shimmer in the city’s grey light. Gehry’s hometown masterpiece, Walt Disney Concert Hall, likewise helped revitalize downtown Los Angeles after its opening in 2003. It, as with Bilbao, is a sculptural showcase for high culture, in this case concert music, about which Gehry is passionate. And it is both flashy and comfortable to visit. 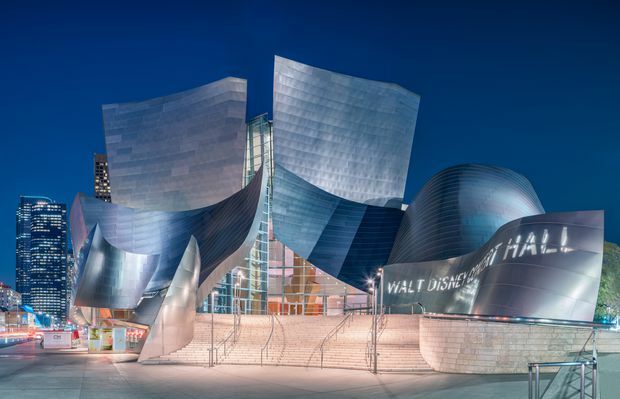 Over the past 20 years, Gehry’s major works have been galleries and concert halls. Thanks to his subtle but magnificent renovation-addition to the Art Gallery of Ontario, Torontonians know that Gehry knows how to build. But Gehry has had an awkward relationship with commerce. Despite his protests, he could have his pick of condo projects and shopping malls around the world. But he’d generally prefer not to; he is an old-school liberal who is defined by his scrappy beginnings. “At the end of the day, he wants to be rich and successful and famous, and he is,” Goldberger says. “But he also wants to be the sort of person who feels guilty about those things, which he is, too.” Gehry has engaged in some philanthropy over the past decade, done a number of cultural and medical buildings pro bono, and his office is working on a planning exercise for the Los Angeles River – an important and complex civic project that builds on his office’s technical skill rather than his design ability. So, as Gehry tries to do good and expand his horizons, how will his values of humanism and sculptural complexity translate into a billion-dollar piece of urbanism? That’s the big question for Toronto right now. And the signs are good. After six years of work, dealing with clients and city planners, Mr. Gehry’s team has massaged the design to a high level of refinement. The masses of the towers, and particularly the way they meet the ground, are more handsome than ever before; and shimmering, irregular glass forms, which the architects call “waterfalls,” pierce the flat facades with great elegance, providing variety and a sense of proportion. The towers “remind me of Toronto,” Gehry says. “They’re evocative of the Toronto I grew up in, but without copying – it’s not a postmodern thing; it’s about body language and scale and feeling. … Maybe it’s been too long; a lot of stuff has now changed the city from the city I knew. So, I could be an anachronism. The exterior of Frank Gehry's house, which he designed, in Santa Monica, Calif., in 1980. Arguably the most important building of the past 50 years. The gallery was described by one prominent critic as “the reincarnation of Marilyn Monroe.” The building’s complex curves were made possible through the use of computer-aided design software – in this case, a program intended for aircraft design – and proved the potential of that technology. The museum also was intended to redefine the city’s image, and did so in spectacular fashion; “the Bilbao effect” became a catchphrase for redefining a city through cultural tourism. Originally designed in the late 1980s, this building became Gehry’s triumph in his adopted hometown. It includes a hall widely acclaimed for its acoustic excellence; but it’s also a very sophisticated piece of urbanism that managed a sloped and somewhat unfriendly site, introducing gorgeous gardens and an outdoor amphitheatre that welcome in passersby. The Walt Disney Concert Hall in Los Angeles. Gehry’s first skyscraper, and at the time the tallest residential building in the city. The 76-storey tower based on “a standard New York apartment building floor plan,” Gehry says; its magic comes at the façades, whose stainless-steel panels appear to billow like a sail in the winds off the harbour. An important precedent for the Mirvish+Gehry project, and a beautiful building. The 76-storey residential skyscraper 8 Spruce Street in Lower Manhattan.